UPDATE (July 12, 2018 at 10.22am CST): The July 10 deal signing ceremony kicked off the start of Tesla's Shanghai operations. The factory will officially open at a later date. This story has been updated and corrected. Tesla CEO Elon Musk was in Shanghai yesterday for the inauguration of the company's first factory in China. After making a quick pit stop in Southeast Asia to drop off a submarine for the Thai cave rescue, the billionaire was spotted muskin' around Pudong for a signing ceremony, which was also attended by city mayor Ying Yong. Musk is also said to be visiting Beijing later this week, according to industry blog Teslarati. The plant will be Tesla's first overseas Gigafactory and will mainly be used to produce batteries and cars. The business license was officially approved earlier this year by the Shanghai Pudong New Area Market Supervision Board. It has been set up with RMB100 million working capital to start, Shine reports. The company's operations will located in the Lingang area, near Dishui Lake in Pudong District. 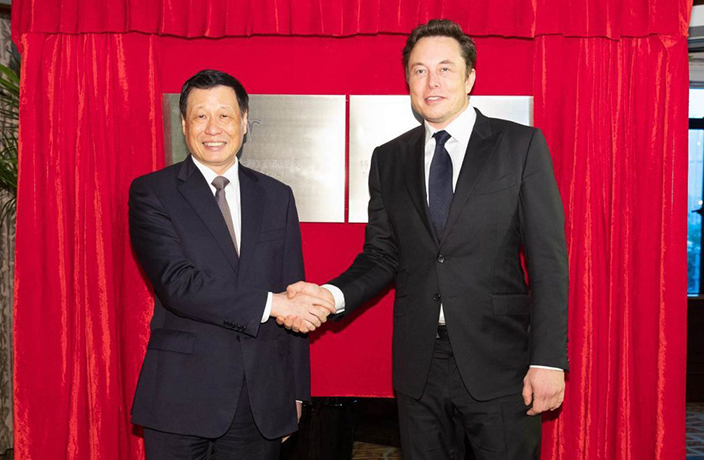 As per the signed agreement, the Shanghai government will support the company in its development of Tesla (Shanghai) Co and the firm's R&D unit. Tesla has been trying to build a factory in China for some time now, but local manufacturing policies intially complicated the plans. According to the policies, foreign carmakers needed to partner up with local companies to be able to manufacture. However, the government recently changed that policy, allowing Tesla to finally open a manufacturing plant in China. The project also comes amid an ongoing trade war between China and the United States. China's retaliatory tariffs against the US include a 25 percent levy on American cars. However, the establishment of the new factory would cut tariff and shipping costs. The new deal presents a huge opportunity for Tesla, since China is the largest and most rapidly growing market for electric vehicles in the world. The factory will be capable of manufacturing a whopping 500,000 vehicles a year. The Tesla CEO was spotted on Wulumuqi Lu grabbing a jianbing.